Return to Entry March 25 – May 11, 2019 Ringel Gallery, Stewart Center Reception: 5:30PM on Thurs, April 4 In celebration of the 50th anniversary of the first lunar landing and the 150th anniversary of Purdue University, Purdue Galleries invited three artists to explore and find inspiration in Purdue’s Barron Hilton Flight and Space Exploration Archives. Their work, along with archival material from the Neil A. Armstrong collection, will be on display in the Robert L. Ringel Gallery in Stewart Center from March 25 through May 11. Only by understanding and engaging with the past can we navigate to a confidently and creatively shaped future. For this exhibition, the artists’ challenge was to bring art, engineering, and science together to imagine new horizons informed by archival documents and artifacts contained in the Neil A. Armstrong Papers and the papers of other astronauts and engineers. This exhibition will feature work by Frances Gallardo, Michael Oatman, and Jennifer Scheuer, and is presented in collaboration with Purdue University Libraries’ Archives and Special Collections. Join us at 5:30PM on Thursday, April 4, 2019, for a panel talk and reception. Ringel Gallery is located in Stewart Center, 128 Memorial Mall, West Lafayette, and is open 10AM – 7PM, Monday through Saturday. All Purdue Galleries exhibits and events are free and open to the public. 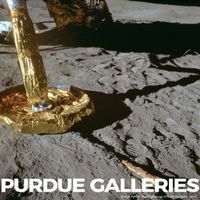 For more information, visit http://www.purdue.edu/galleries or follow @PurdueGalleries on Facebook, Twitter, and Instagram.